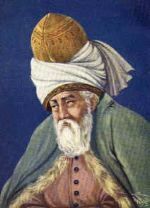 Poetry Chaikhana | Mevlana Jelaluddin Rumi - God is "what is nearer to you than your neck-vein,"
God is "what is nearer to you than your neck-vein,"
You have cast the arrow of speculation afar off. The game is close to you, and you shoot too far off. And the more removed from the treasure he seeks. The further he is removed from his heart's desire. The Almighty says, "Make efforts in our ways,"
Not "Make efforts away from us," O restless one.